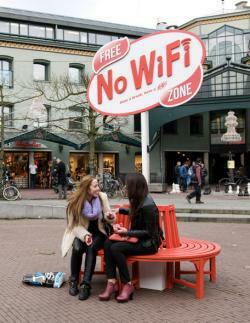 KitKat's wifi-free zone bench ad campaign appeals to the mini-digital Sabbath crowd. Photograph by Tim Keen/JWT Amsterdam. On any hectic workday, a digital Sabbath can seem utopian—a day without the obligations of the connected world, both perfect and unattainable. But what if you just want a few precious minutes in a safe place where emails can’t find you? In that case, you’ll probably love Kit Kat’s new ad campaign in Amsterdam. Nestle (which sells the candy internationally, though it’s a Hershey treat in the United States) recently built a “Free No-WiFi Zone,” in line with the slogan, “Have a break, have a Kit Kat.” The concept is simple: just a public bench and a device to fight off those pesky signals from the outside world. As the advertiser describes, the zone disrupts all wireless signals within five meters, giving people a chance to enjoy a newspaper, a book, or even a conversation with an actual human being. Having a dedicated public space to impose the firewall for us is a fine idea. With the Internet even making its way onto airplanes and subways, why not build a new refuge, and one that’s accessible to everyone? The only request I have is for some free WiFi benches a few feet away—I can’t waste any time catching up on everything I missed during the break.